Design for ANCAAA-Boomalli exhibition poster by Jeffrey Samuels and Fern Martins, 1988. Reproduced courtesy Boomalli Aboriginal Artists Co-Operative. The Boomalli Aboriginal Artists Co-operative was established in 1987 by a group of 10 urban Aboriginal artists in Sydney. After more than 30 years the cooperative continues to support contemporary Indigenous artists from throughout NSW, offering a gallery and venue to show their work. 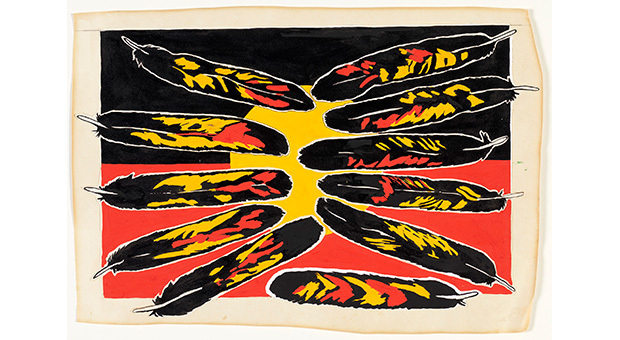 Boomalli artists and their works will be represented at the State Library of NSW through a selection of exhibition posters produced since 1987.